Puns can be a translator’s bane since the ninety-nine times out of a hundred, there will be no equivalent pun in English for the pun in Japanese. Still, humor is a big part of manga, and puns a huge part of Japanese humor. So here are tips on how to deal with puns. Puns are everywhere in manga, especially gag manga, and there is no tried-and-true method of translating them. Each instance will be different, because each pun, and its circumstances, will be different. Generally puns have two meanings, one that pertains to the plot and one mainly for humor. Ideally, you'd find an hilariously funny English pun that conveys not only both meanings, but also the nuance of the original. I've translated manga for over a quarter century, and I don't think I've ever managed this. So instead, I try for a pun that conveys both meanings, even if I can’t capture the nuance. Also, the Japanese laugh at puns, while most English speakers groan, so the hilarity will be muted in the English version. Still on the rare occasion when I’m successful, there's a real joy in "getting the pun right." After I cut the grass, I smelled as bad as if I had cut the cheese. The length of the sentence is longer than the Japanese (a consideration when translating manga), but the meanings came out pretty close. And sometimes the drop in pun quality is bad enough that you don't get that rush of accomplishment. The new one was news to me. It's not as funny, but the meaning is still similar. When there is no exact translation, there are less-optimal options. One is to find some other word in the sentence to pun. You still faithfully translate plot-related meaning, and somehow give the sentence the lighthearted feeling of the original. These rules of coordination rule! Remember, these are not ideal puns. If you feel this pun lacks the punch of the original, I agree with you. But under a deadline, you take your best stab and move on. Sometimes inspiration will hit before you submit the script, and sometimes it won't. A similar method is to add information that allows you to make a pun, as long as it doesn't change the original meaning too much. When nobody answered, my cell phone call was a self-own! I added the word "cell" to make the pun. An option popular in the 1990s was to substitute a completely different pun for the original, but this style of translation has since fallen out of favor. If the book you're translating allows for translator's notes, another bad-but-available option is to explain the pun there. One would translate the pun's plot-related meaning, and explain in the back of the book that there was originally a pun. It deprives the English reader of the feel of the Japanese version, but sometimes there is just no way to translate a pun. Added Translator's note: There is a pun in the original line. Since Japanese calls Germans by kanji that mean "Germany-person," and the word for "Germany," Doitsu, sounds exactly like a Japanese word for, "Who." If your translation doesn’t allow for translator's notes or gutter notes, and the pun is untranslatable, you have to bite the bullet and simply translate the part of the pun that is most connected with the plot of the story. In this case, the audience will never know there was a pun in the Japanese version. Usually, you’ll have to choose one of these less-than-ideal options. It stinks because the English-language readership will not receive the same experience as the Japanese readers, but translation is compromise, and in most cases, the ideal solution is nowhere to be found. Just give it your best shot and move on. 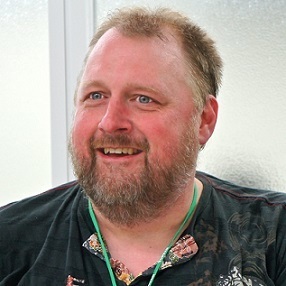 William (Bill) Flanagan started translating manga professionally in 1991 with Raika (Kaumi Fujiwara & Yu Terashima) and has been translating and editing manga ever since. He rose to be Director of Editorial of Viz Media in the early 2000s and from then on, has had his hand in top-selling manga. He also translates anime, games, TV, movies and novels. Representative manga translations include Alice in Murderland (Kaori Yuki), Fairy Tail (Hiro Mashima), and A Bride's Story (Kaoru Mori). He lives with his wife and son in the mountains of Gifu Prefecture, Japan. 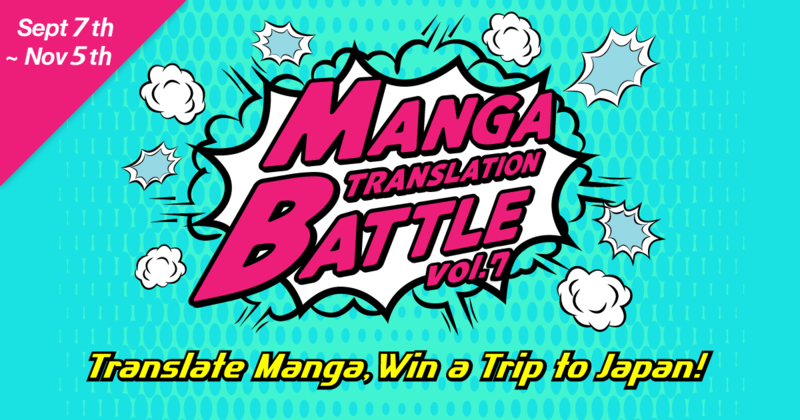 Click the banner to be taken to the Manga Translation Battle Homepage!